Since the founding of the Lodge project in 2006 a truly amazing plethora of evidential physical mediumship and related spiritually effected phenomena has become witnessed by regular attendees and guests alike. Nevertheless, at no time do we claim to offer proof of soul survival...although many have become convinced of this truth through their personal receipt of undeniable evidence. Currently the Lodge supports several developing physical mediums, each sitting on a regular basis within an individualised home circle environment. This male medium first came along to the Lodge as a guest sitter in 2011 and was soon afterwards invited to sit for development within a home circle setting. Currently within many of his séances, which are held twice weekly in lit conditions (at no time is the medium out of sight) complex percussion rapping emanates from within the wooden floor, cabinet frame and furniture. The spiritually effected movement and levitation of objects is also demonstrated, as well as complex visual and audio phenomena. This male medium, connected with the Lodge circle since 2006, currently demonstrates trance channelled communication and transfiguration phenomena. His spirit team may also offer support to encourage the healing of the physical form. In June of 2018 a gentleman initially came along to the Lodge as a supporting sitter, then after awhile was offered the opportunity of sitting for a period of developmental experimentation. Reports of his initial sittings are offered here. This female physical medium sat regularly for development within the Lodge for a period, before moving on to continue gathering evidence more widely. Her seances were held in both blackout and lit conditions. How did the Lodge project begin? 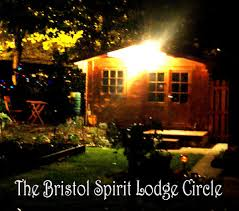 The Bristol Spirit Lodge project was founded in October 2006, with the building of the first garden shed séance room. The first séance was held in that building early in February 2007. The project initially began as a personal experiment to discover to my satisfaction whether there is any likely truth in the potential reality of continuing consciousness following physical death...or not. Since then, as a result of receiving (mainly through physical mediumship) overwhelming and convincing evidence that 'life goes on', my desire to support the development and demonstration of evidential mediumship and related physical phenomena has continued...with my passion for the subject growing ever stronger. Since the founding of the Lodge project well over two thousand séances have been hosted, with those of like mind sitting with intent to support the development and demonstration of evidential physical mediumship and associated spiritually effected phenomena through a number of different mediums. The self-motivated regular attendance of the mediums, supporting sitters and guest witnesses is of paramount importance, therefore at no time is any attendance fee requested by myself or any participant. The Lodge project remains a private venture and unaffiliated with any religious or spiritual organisation. Copyright Chris Di Nucci. Simple theme. Theme images by andynwt. Powered by Blogger.